What are y’all’s thoughts on wide leg pants? I must admit, this is my first (and only) pair. I generally prefer a skinny-style pant, simply because I believe they are more flattering 98% of the time. However… I found this pair of white pants on serious sale at Zara for like $30 and thought I’d give them a try. When I put them on, I was surprised to find that they fit like a dream! They’ve manage to straddle the line between being tailored and relaxed at the same time. I think they’ll be a nice alternative to my white jeans this summer, and maybe even a good pair for recreating those chic winter white looks I’m always coveting on Pinterest! While this pair is no longer available, I did find a couple similar trousers here and here! Love that bag, the color is perfect! That BAG! Have fun in NYC! I like the white pants. I’m on a hunt for a pair of new white jeans and birthday dress. Like the sweater too. Have a great weeknd! I love a good wide leg pant – I think they always look sophisticated & chic and these are no exception! Plus, the pop of blue from your bag adds a fun element! WOW! Can’t believe that these pants are from ZARA. You look stunning! 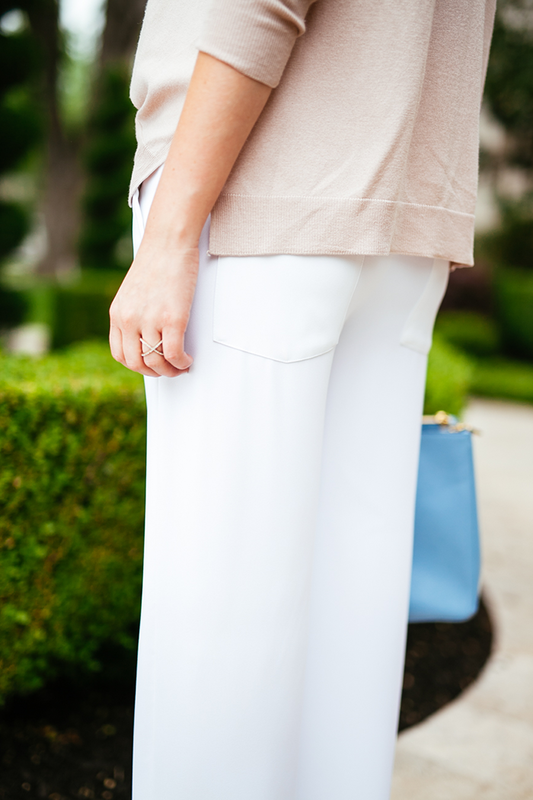 I’m loving these wide leg white pants paired with the tan sweater and powder blue bag! Have a great weekend Merritt! I’m loving the white trousers, they are so tailored and chic looking. The light palette is always so pretty on you, and that bag is fab. I’m with you… I’m still partial to skinnies. I think these pants look great on you! Perfectly styled. Have fun in NYC! The wide leg pants look super comfy, and I’m loving the color of the blush sweater! This is such a chic take on this trend and I love the back pockets! These look gorgeous on you! I love the white. I think it’s fun to have a flare pair to mis things up occasionally. I usually prefer skinny pants, too, but have been loving a sophisticated wide-leg pant like this lately! Such a nice switch-up for spring. Have a great time in NYC! 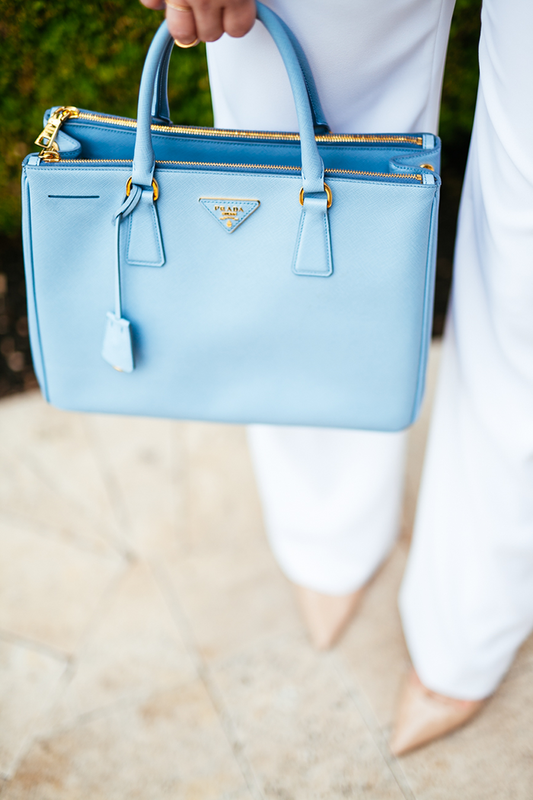 love everything about this…such a perfect summer sweater, love the flowy white pants & pointy toe heels and whats not to love about a sky blue Prada? Those pants look amazing on you, and that bag is absolutely gorgeous! Have fun in New York!